Los Angeles World Airports (LAWA) has been recognized as a leader in reducing carbon emissions by Airports Council International-North America (ACI-NA). 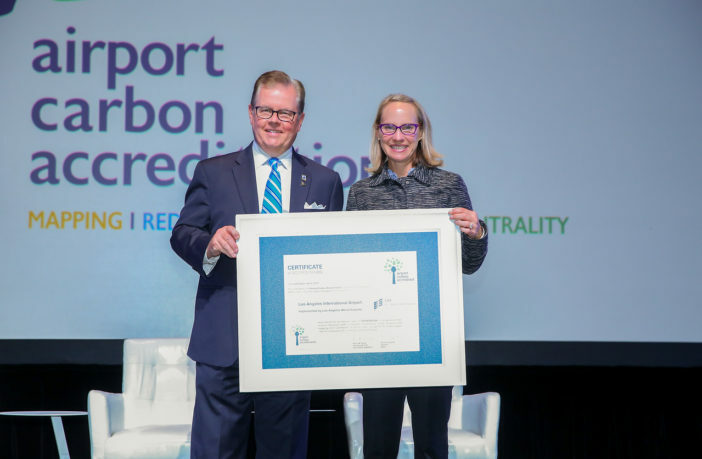 Both Los Angeles International (LAX) and Van Nuys general aviation (VNY) airports were recognized as carbon-accredited for the third year in a row at the ACI-NA annual conference. The certification reflects LAWA’s independently verified commitment to reduce air pollutant emissions in line with reduction goals. Deborah Flint, CEO at LAWA, said, “Environmental stewardship is woven into all that we do at Los Angeles World Airports and we are proud that our efforts to reduce emissions and to work with our partners to do the same has once again been recognized by Airports Council International – North America. The Airport Carbon Accreditation program (ACA) is a voluntary program that allows airports to have their efforts to quantify and reduce greenhouse gas (GHG) emissions independently verified by ACI-Europe. LAX has a goal to reduce the airport’s GHG emissions to below 45% of 1990 levels by 2025, 60% by 2035 and 80% by 2050. Kevin M Burke, ACI-NA president and CEO, commented, “Airports strive to be good partners within their communities and in the global aviation system by promoting sustainability and environmentally responsible practices.